Groppo, M. (2010). Neotropical Rutaceae. Trees or shrubs (these many- to few-branched), rarely sub -shrubs or herbs (Apocaulon R. Cowan from Peru and Ertela Adans. 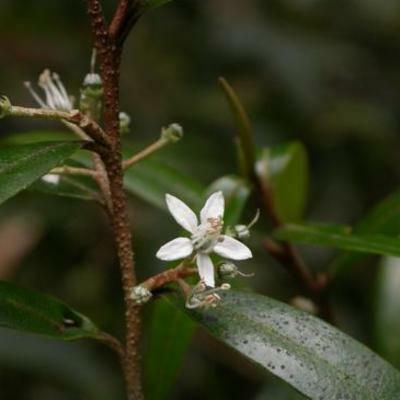 from Brazil), usually evergreen , very rarely deciduous , some aculeate (Zanthoxylum L. spp.) or armed with thorns (Raulinoa R. Cowan, some Citrus L.), all organs with glandular dots containing ethereal aromatic oil; stipules lacking. Leaves alternate , opposite or whorled , 1-3-foliolate, pinnately (including 2- pinnate in Dictyoloma A. Juss.) or palmately compound , rarely simple ; lamina usually with the ethereal oil glands visible as pellucid dots. Inflorescences terminal or axially, very rarely cauliflorous , in racemes, cymes, thyrses (including diplo-thyrses), spikes, or other types. Flowers (4-)5- merous , actinomorphic or zygomorphic (mostly in Galipeinae), bisexual or rarely unisexual by abortion (plants dioecious or monoecius); sepals with free or connate lobes, aestivation imbricate or valvate ; petals free or connate (Gallipeinae), aestivation imbricate , rarely valvate (e.g. Hortia Vand. ); stamens usually as many as petals in Neotropical groups and alternating with the corolla lobes, or reduced to only 2 (together with 3-5 staminodes) or 3 (with 2 staminodes) functional stamens in Galipeinae, the filaments usually free or rarely connate , sometimes adnate to the corolla , some with basal appendages, dehiscence longitudinal; intrastaminal disc usually present, rarely absent (e.g. Adiscanthus Ducke), entire or rarely reduced to a unilateral incomplete disc (Ertela); gynoecium composed of (1-2-)4-5 carpels in Neotropical groups, free to fully syncarpic to different degrees, locules as many as carpels; ovary (-ies) superior , placentation axial or parietal in the apocarpic ovaries, ovules per locule usually (1-)2 in Neotropical groups (4-5 in Dictyoloma), superposed or collateral. Fruits capsules or schizocarps with 1-5 dehiscent or indehiscent (Pitavia Molina) mericarps, or samaras (e.g. Balfourodendron Méllo ex Oliv., Spathelia L.), samaroids (Helietta Tul. ), drupes or berries (Hortia, cultivated Citrus and allies), the capsules and dehiscent mericarps often with a detaching endocarp ejecting the seeds when mature. Seeds 1-2 to many per carpel ; endosperm present (copious or scarce) or absent; cotyledons straight or curved, fleshy or thin and leaf-like, these sometimes folded. 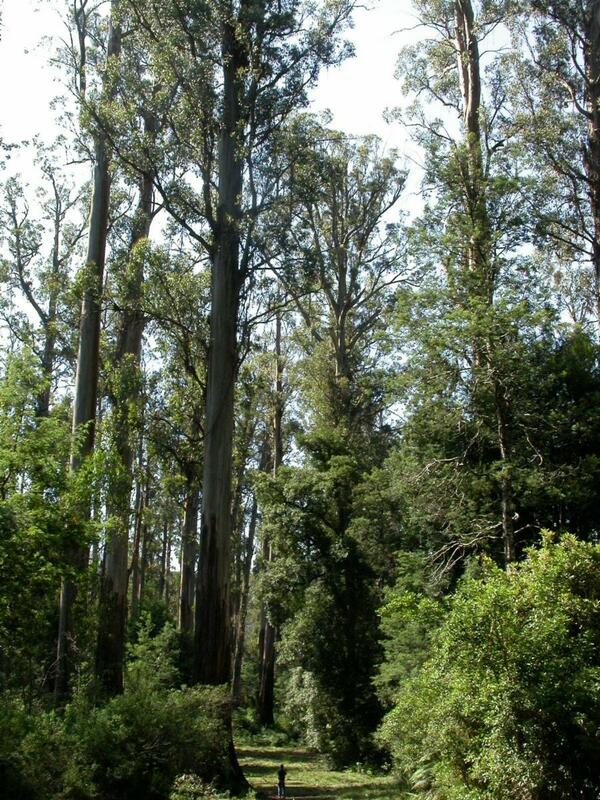 About 160 genera and 1,900 species of Rutaceae were recognised by Groppo et al. (2008), of which 48 genera and 350 species occur in the Neotropics (Kallunki 2004), 44-50 of these species belong to the genus Conchocarpus (Galipeinae). Rutaceae is widely distributed in subtropical and tropical or less frequently in temperate regions of the world. In the Neotropics the family is more diverse in the understorey of moist forests, especially in Brazilian Atlantic rain forests (Galipeinae), but species of this group can also be found in drier areas (e.g. Casimiroa, Zanthoxylum, Balfourodendron and Helietta). Cneoridium, Thamnosma, and some Zanthoxylum, Ptelea and Choisya species occur in desertic or temperate areas in North America (Mexico); and the monospecific Pitavia occurs in temperate areas in Chile.Adiscanthus Ducke - native, 1 species, Amazon (Peru, Venezuela, Brasil). Almeidea A. St-Hil. - native, 5 species, Brazil and Bolivia. Amyris P. Browne - native, c. 40 species, USA (Texas, Florida), Mexico, Central America (including West Indies) to Peru and Brazil. Andreadoxa Kallunki - native, 1 species, Brazil (Bahia). Angostura Roem. & Schultes - native, 8 species, Central America (Nicaragua) and southwards to Venezuela, Southern Brazil and Bolivia. Apocaulon R. Cowan - native, 1 species, Venezuela (Guyanan Shield). Balfourodendron Méllo ex Oliv. - native, 2 species, Northeastern to Southern Brazil, Paraguay and Northeastern Argentina. Casimiroa Llave & Lex. - native, c. 10 species, North America (Texas-USA, Mexico) to Costa Rica. Choisya Kunth - native, 7 species, Mexico and Southern USA (Arizona). Citrus L., Murraya Koenig ex L.and other allies (subfamily Aurantioideae) - introduced from Asia, cultivated as ornamentals or because of their edible fruits (Citrus). Cneoridium Hook.f. - native, 1 species, USA (California). Conchocarpus Mikan - native, 46-50 species, Central America (Nicaragua) and southwards to Bolivia and Southeastern Brazil. Decagonocarpus Engl. - native, 2 species, Venezuela (Guyanan Shield), Northern Brazil, Colombia. Decatropsis Hook.f. - native, 2 species, Central America (Guatemala, Honduras), Mexico. Decazyx Pittier & S.F. Blake - native, 2 species, Central America (Costa Rica, Guatemala, Honduras), Mexico. Desmotes Kallunki - native, 1 species, Central America (Panama, endemic to Coiba Island). Dictamnus L. - introduced from the Old World, cultivated. Dictyoloma A. Juss. - native, 1 species, Peru, Bolivia and Brazil. Ertela Adans. - native, 2 species, Mexico through Northern and Central South America (Brazil, Peru, Bolivia). Erythrochiton Nees & Mart. - native, 7 species, Central America (Costa Rica) across Northern South America and South to Bolivia and Brazil. Esenbeckia Kunth - native, 28 species, Mexico to Northeastern Argentina. Euxylophora Huber. - native, 1 species, Brazil (Pará). Galipea Aubl. - native, c. 17 species, Cuba and from Guatemala southwards through the Neotropics. Helietta Tul. - native, 8 species, Mexico and USA (Texas), Central America (Cuba), Northern South America, Peru, Paraguay, Brazil and Northern Argentina. Hortia Vand. - native, 10 species, Panama, Northern South America to São Paulo state (Brazil, Atlantic rain forest); one species in Brazilian and Bolivian savannahs). Leptothyrsa Hook.f. - native, 1 species, Amazon (Brazil, Colombia, Peru). Lubaria Pittier - native, 1 species, Costa Rica, Venezuela. Megastigma Hook.f. - native, 1-2 species, Central America (Guatemala), Mexico. Metrodorea - native, 5 species, Surinam through Brazil to Bolivia. Naudinia Planch. & Linden - native, 1 species, Colombia. Neoraputia Emmerich - native, c. 8 species, French Guiana, Peru, Venezuela, Brazil (Amazon and Atlantic rain forests). Nycticalanthus Ducke - native, 1 species, Brazil (Central Amazon). Plethadenia Urb. - native, 2 species, Central America (Cuba and Hispaniola). Peltostigma Walp. - native, 3 species, Central America (West Indian Islands, Guatemala, Nicaragua), Mexico and Peru. Phellodendron Rupr. - Old World, cultivated. Pilocarpus Vahl. - native, 16 species, Mexico, Central America (including the Antilles) to Argentina. Pitavia Molina - native, 1 species, Southern Chile. Polyaster Hook.f. - native, 1 species, Mexico. Ptelea L. (include Taravalia Greene) - native, 1-6 species, North America (Mexico and USA). Raputia Aubl. - native, 10 species, Northern South America. Raputiarana Emmerich - native, 1 species, Brazil (Amazonia). Rauia Nees & Mart. - native, c. 7-8 species, Brazil (Atlantic Rain Forest). Raulinoa R. Cowan - native, 1 species, Brazil (restricted to Santa Catarina). Ravenia Vell. Conc. - native, c. 14 species, Central America (Greater Antilles, Trinidad), from Honduras to Brazil and Peru. Raveniopsis Gleason - native, 19 species, Venezuela (Guiana Shield), Northern Brazil. Ruta L. - Old world, cultivated. Rutaneblina Steyerm. & Luteyn. - native, 1 species, Venezuela (Guyanan Shield). Sigmatanthus Huber ex Emmerich - native, 1 species, Brazil (Northeast, Pará to Ceará). Spathelia L. - native, c. 15 species, Mexico, Central America (Bahamas, Cuba, Jamaica) Northern South America to Brazil (Rondonia and Mato Grosso states). Spiranthera A. St-Hil. - native, 5 species, Northern South America, Peru, Bolivia to Brazil (savannah and Atlantic forest). Stauranthus Liebm. - native, 1-2 species, Mexico to Panama. Thamnosma Torrey & Frémont - native, 8-9 species (3-4 in America), Northeastern Africa, Southern USA and Northern Mexico. Ticorea Aubl. - native, 5 species, throughout the Amazon in the Guianas, Brazil, Ecuador, Perua and Bolivia. Toxosiphon Baill - native, 4 species, Southern Mexico south to Panama, Ecuador, Northern Bolivia and Brazil. 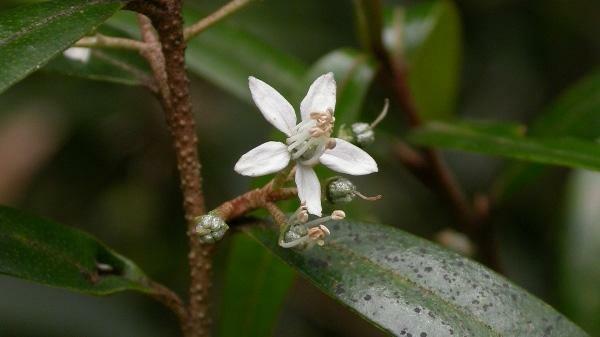 Zanthoxylum L. - native, c. 180-200 species, (sub) tropics worldwide, c. 72 in America, widespread. In many Neotropical Rutaceae (all Galipeinae, Pilocarpus , Metrodorea , Raulinoa , Esenbeckia , Plethadenia , Peltostigma and Zanthoxylum ) the fruits are capsules or schizocarps with 1-5 dehiscent mericarps, many times with a detaching endocarp that ejects the seeds when mature, a mechanism analogous to that found in most Euphorbiaceae. Tribe Galipeinae, the most diverse group of the Neotropics with 28 genera and c. 130 species, includes species with mostly zygomorphic flowers, a more or less tubular corolla, the filaments adnate to the corolla tube, and 2 (rather than 5) stamens and 3 staminodes. 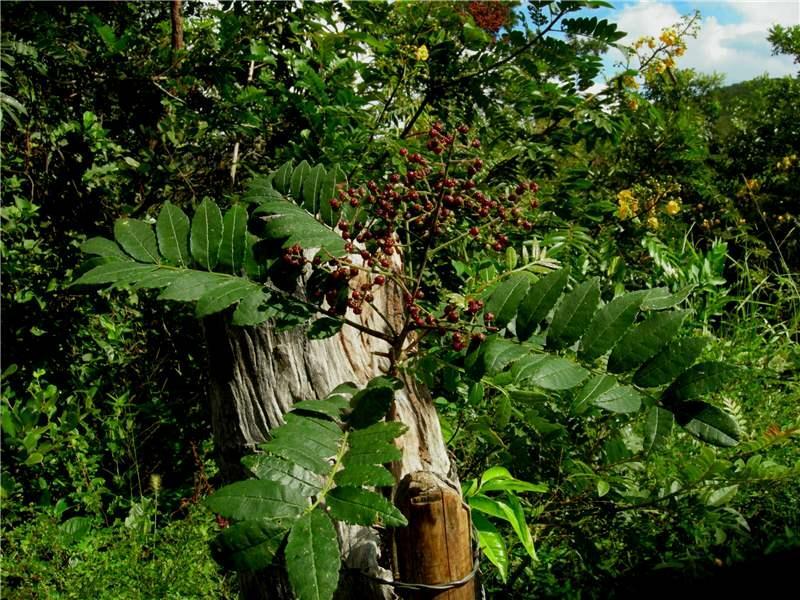 Zanthoxylum consists of species with pinnate leaves, frequently with aculeate (spiney) bark and (sometimes) leaves. Flowers are unisexual (in dioecious species). Metrodorea , Esenbeckia , Helietta , Balfourodendron , Pilocarpus and Raulinoa are trees or shrubs with 1-3-foliolate (rarely simple or pinnate - some Pilocarpus ) leaves. They have small, actimorphic flowers, usually creamy white (some species with wine-red flowers in Pilocarpus and Metrodorea ). Raulinoa (endemic to Santa Catarina state, Brazil) are armed with thorns. Pilocarpus have racemose inflorescences, while the remaining genera have compound inflorescences (panicles or thyrses). Metrodorea and Esenbeckia have capsular fruits. Metrodorea have opposite leaves (like in some species of Esenbeckia ) with the sheaths of the opposite leaves joined at base with the upper part cucullate, protecting the apical branch bud. In Balfourodendron and Helietta the fruits are indehiscent and winged. Casimiroa (Mexico and some parts of Central America) and Hortia (South America and Panama, most species in the Amazon) have baccate fruits. Casimiroa have palmately compound leaves and small, creamy-white flowers. Hortia have simple, usually large leaves (30-120 cm long) and pink flowers in large inflorescences. Dictyoloma and Spathelia have small flowers with staminal filaments with hairy basal appendages as do some Simaroubaceae. Dictyoloma have 2-pinnate leaves and winged seeds. Spathelia are monopodial trees from the Amazon and Central America with large, 1-pinnate leaves crowded at the apex of the trunk as palms, and with samaroid fruits. Rutaceae can be confused with other families of Sapindales such as Meliaceae, Simaroubaceae or Sapindaceae because of the compound leaves, but they can be readily distinguished from these by the aromatic leaves with pellucid dots, which are scattered throughout the lamina or restricted to the margins. 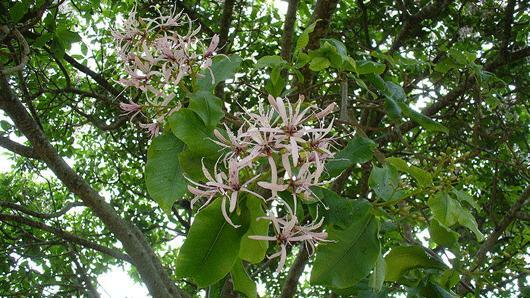 There are several species of few-branched (frequently monopodial) shrubs from understorey of forested areas in Brazil and other countries with simple, large and alternate leaves that can be confused with other groups such as Clavija (Theophrastaceae), Pouteria (Sapotaceae) and member of the Euphorbiaceae. Trees or shrubs, less often sub -shrubs or herbs. Flowers usually actinomorphic and small, usually white or cream. Fruits capsules or schizocarps with 1-5 dehiscent mericarps, often with a detaching endocarp that ejects the seeds when mature, a mechanism analogous to most Euphorbiaceae. Leaf lamina aromatic, usually with ethereal oil glands visible as pellucid dots. Rutaceae are best known by the exotic genus Citrus, because of its commercially consumed fruits. Other groups of the same subfamily of Citrus (Aurantioideae, see discussion above) are commonly cultivated as ornamentals in America, including species of Atalantia, Clausena, Murraya, and Swinglea. 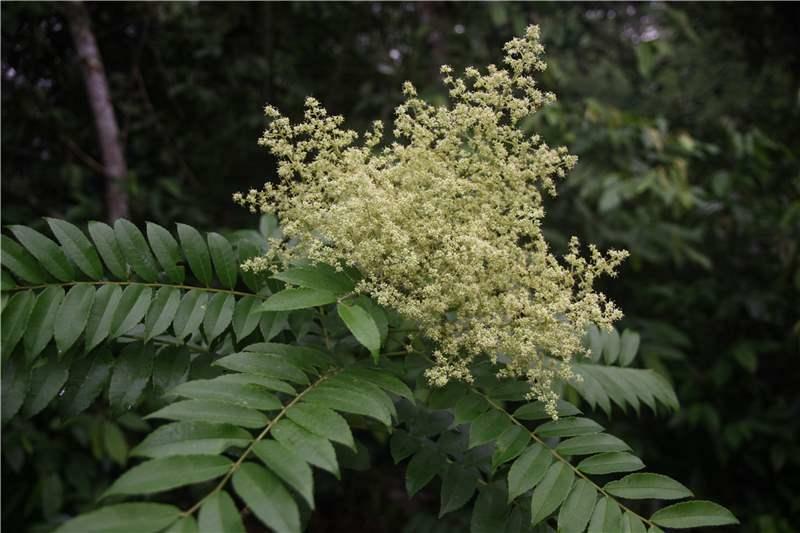 Other extra-American cultivated genera are Dictamnus, Phellodendron, and Ruta. 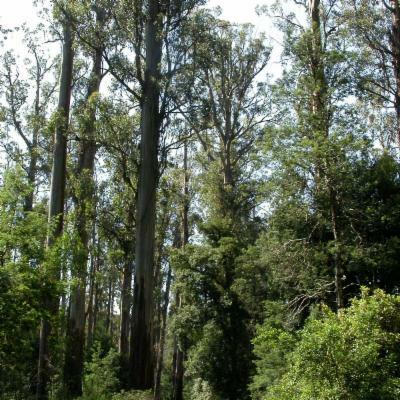 Native species are used as commercial timbers, such as Euxylophoraparaensis Huber ("pau-amarelo"), Balfourodendronriedelianum (Engl.) Engl. ("pau-marfim"), both from Brazil, and Zanthoxylumflavum Vahl ("West Indian silkwood"). Species of Pilocarpus (the "jaborandis") are sources of the alkaloid pilocarpine, used to treat glaucoma: one of the species, P. microphyllus Stapf ex Wardlew. is commercially cultivated in Brazil. 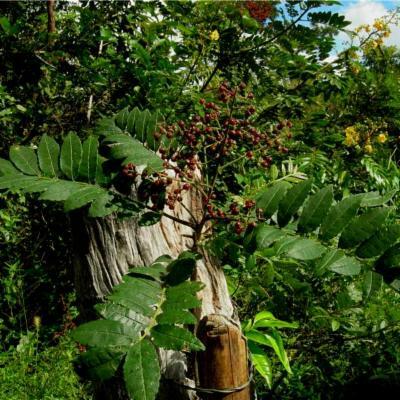 The bark of some species of Angostura, Galipea and Hortia are used to treat fevers. Casimiroa edulis La Llave & Lex. ("zapote blanco", "white-zapote") is cultivated for its edible fruits in Central America. The division of the family Rutaceae in seven subfamilies (Aurantioideae, Dictyolomatoideae, Flindersioideae, Rhabdendroideae, Rutoideae, Spathelioideae, and Toddalioideae) by Engler (1931) was based mainly on morphological characteristics such as degree of connation and number of carpels, fruit characteristics (e.g. dehiscent vs. indehiscent, fleshy or dry, winged or not) and histology of the glands with ethereal aromatic oil. 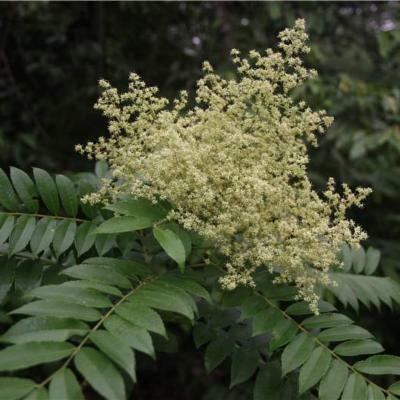 Recent analyses using molecular, chromosomal, and phytochemical evidence have showed Aurantioideae as a monophyletic group, but not Rutoideae, Toddalioideae and Flindersioideae, and these groups must therefore be re-circumscribed. The monogeneric Spathelioideae (Spathelia) and Dictyolomatoideae (Dictyoloma) are part of a larger clade containing African and European genera such as Bottegoa Chiov., Cedrelopsis Baill., Cneorum L., Harrisonia R. Br. ex A. Juss. and Ptaeroxylon Ecklon. & Zeyher. in a re-circumscribed and expanded Spathelioideae (see Chase et al. 1999 and Groppo et al. 2008 for a more detailed discussion). Some Neotropical genera such as Conchocarpus Mikan and Esenbeckia Kunth appear not to be monophyletic, and studies treating their circumscriptions are currently underway. Chase, M.W., Morton, C.M. and Kallunki, J.A. 1999. Phylogenetic relationships of Rutaceae: a cladistic analysis of the subfamilies using evidence from rbcL and atpB sequence variations. American Journal of Botany 86: 1191-1199. Emmerich, M. 1978. 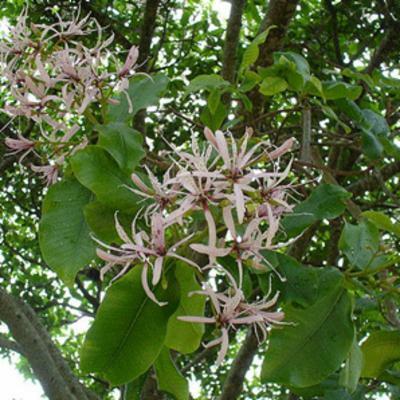 Contribuição ao conhecimento da tribo Cusparineae (Rutaceae). Nova Conceitual de Raputia e gêneros derivados. Rodriguésia 39(45): 224-307. Engler, A. 1874. Rutaceae. In: C.F.P. Martius and A.G. Eichler (eds. ), Flora brasiliensis., vol. 12, pt.2, 75-196. Typographia Regia, Munich. Engler, A. 1931. Rutaceae. In: H.G.A. Engler and K. Prantl (eds. ), Die natürlichen Pflanzenfamilien, ed. 2, T. 19a, 187-359. Wilhelm Engelmann, Leipzig. Groppo, M. 2004. Filogenia de Rutaceae e revisão de Hortia Vand. PhD thesis. University of São Paulo, São Paulo. Groppo, M., Pirani, J.R., Salatino, M.F.L., Blanco, S.R. and Kallunki, J.A. 2008. Phylogeny of Rutaceae based on two noncoding regions from cpDNA. American Journal of Botany 95(1): 985-1005. Kaastra, R.C. 1982. Pilocarpinae (Rutaceae). Flora Neotropica Monograph. 13. The New York Botanical Garden, New York. Kallunki, J.A. 1992. A revision of Erythrochiton sensu lato (Cuspariinae, Rutaceae). Brittonia 44(2): 107-139. Kallunki, J.A. 1994. Revision of Raputia Aubl. 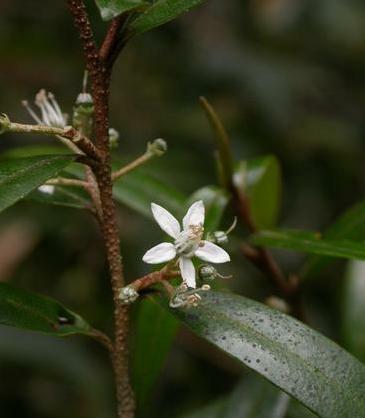 (Cuspariinae, Rutaceae). Brittonia 46(4): 279-295. Kallunki, J.A. 1998. Andreadoxa flava (Rutaceae, Cuspariinae): a new genus and species from Bahia, Brazil. Brittonia 50(1): 59-62. Kallunki, J.A. 2004. Rutaceae In: N. Smith, S.A. Mori, A. Henderson, D.W. Stevenson & S.V. Heald (eds.) Flowering Plants of the Neotropics. pp. 333-335. Princeton University Press, Princeton. Kallunki, J.A. 2009. Validation of Neoraputia (Galipeae, Rutaceae) and description of two new species from Eastern Brazil. Brittonia 61(1): 28-34. Kallunki, J. A., and J. R. Pirani. 1998. Synopses of Angostura Roem. and Schult. and Conchocarpus J. C. Mikan. Kew Bulletin 53: 257-334. Pirani. J.R. 1998. A revision of Helietta and Balfourodendron (Rutaceae, Pteleinae). Brittonia 50: 348-380. Pirani, J.R. 2002. Rutaceae. In: Wanderley, M.G.L., Shepherd, G.J., Giulietti, A.M. (eds.). Flora Fanerogâmica do Estado de São Paulo. vol. 2: 281-308. São Paulo, Fapesp/HUCITEC. Reynel, C. 1995. 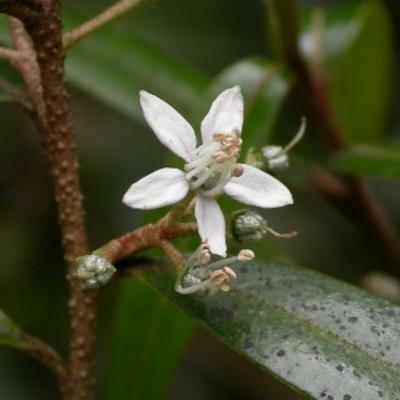 Systematics of Zanthoxylum (Rutaceae) with an account on the wood anatomy of the genus. PhD thesis. University of Missouri, Saint Louis. Salvo, G., Bacchetta, G., Ghahremaninejad, F. & Conti, E. 2008. Phyllogenetic relationships of Ruteae (Rutaceae): new evidence from the chloroplast genome and comparisons with non-molecular data. Molecular Phylogenetics and Evolution 49: 736-748. Skorupa, L. A. 1996. Revisão taxonômica de Pilocarpus Vahl (Rutaceae). PhD thesis. University of São Paulo, São Paulo. Vepris Comm. ex A Juss.